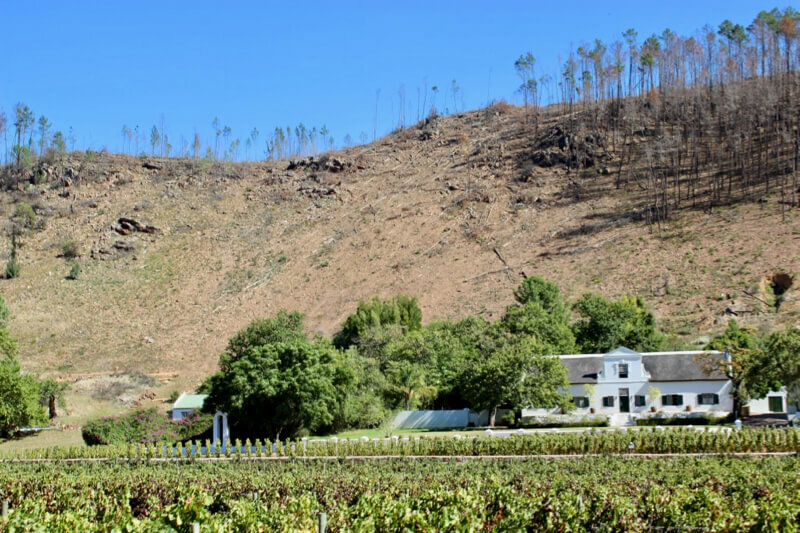 Driving through to the winelands usually involves me doing the driving, which ultimately means I don’t really get to appreciate the surrounding scenery. 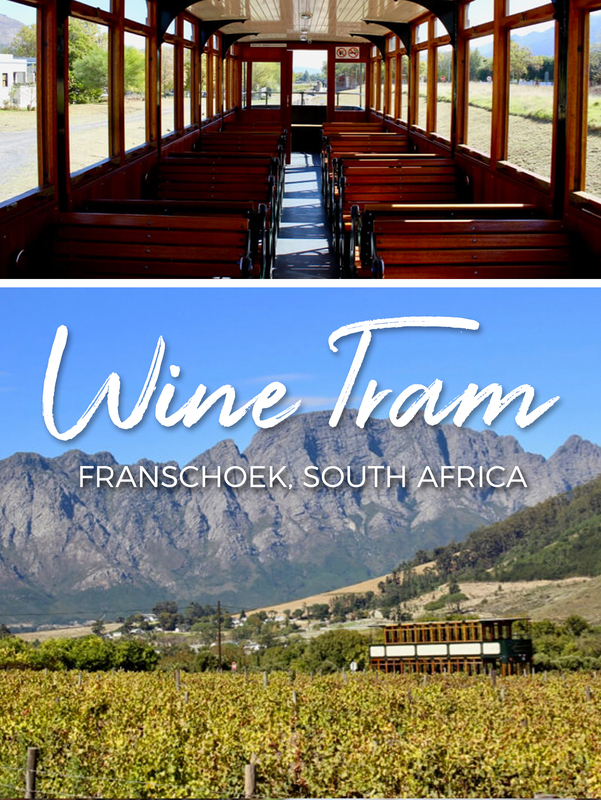 So while driving out to Franschhoek I was reminded how much I was looking forward to a trip on the Franschhoek Wine Tram. 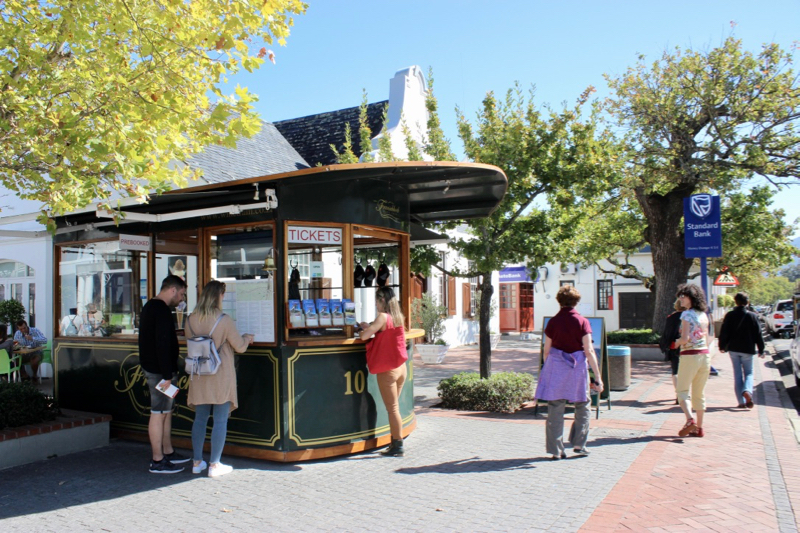 We drove straight into the heart of Franschhoek where we parked our car on the main road and crossed over to the little ticket booth in the central square to collect our tickets. We waited 5 minutes and then were called to join the group travelling on the green line, or was it yellow, I actually cannot remember? 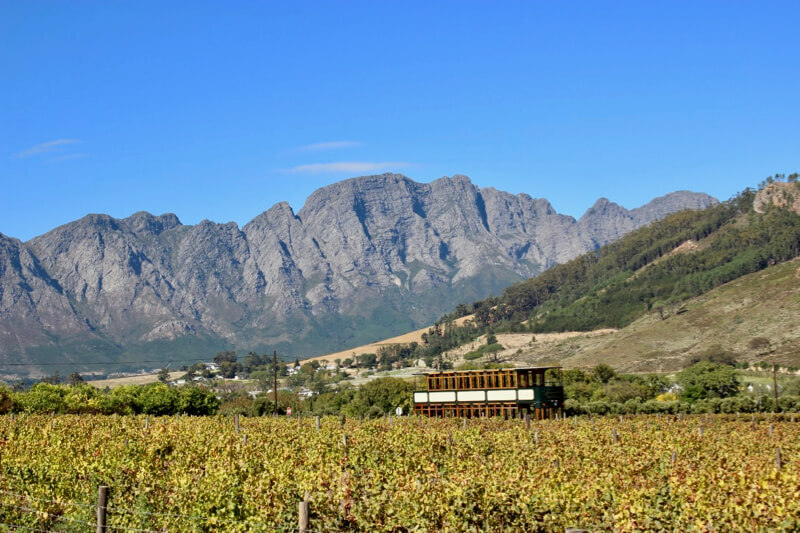 The idea is that you pick a line and stick with it – hopping on and off at the various wine farms along the route, spending about 45 mins to 1 hour at each stop you choose. 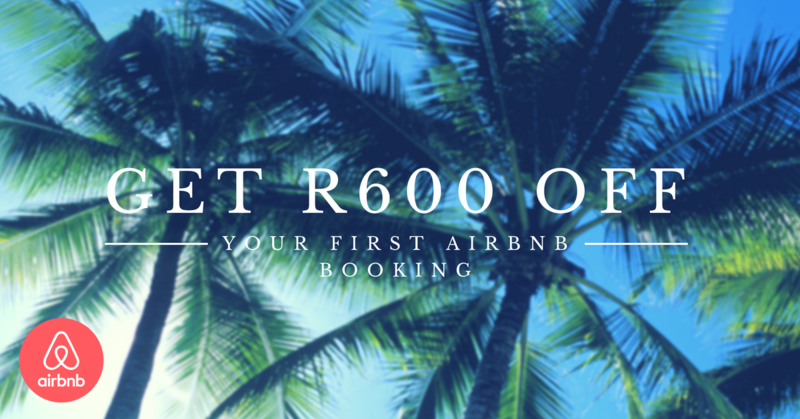 You can skip one you’ve been to before and head to the ones you’ve never visited, or head straight for your favourites! The choice is yours! 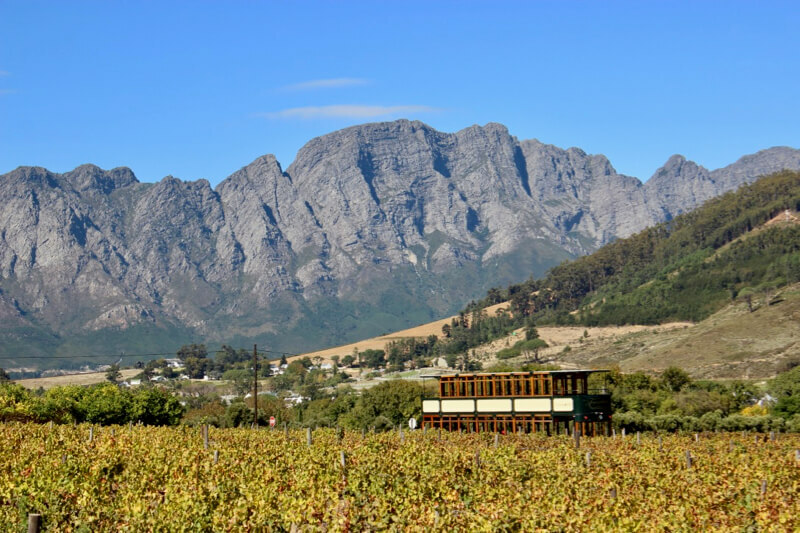 We headed off to jump onto a converted bus and were driven through to where the wine tram commences its’ journey. Yes, thats me, waiting with much anticipation, although I would never really admit to it! 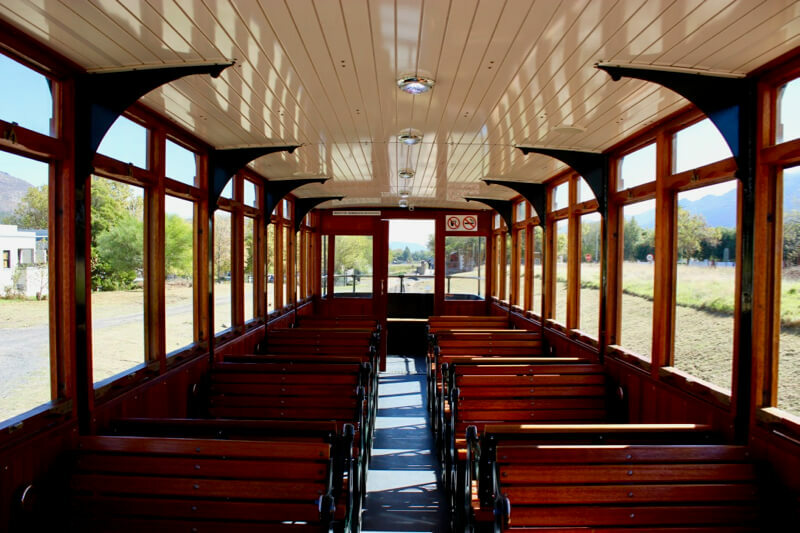 The tram is decked out in a characterful wood finish, and the deck at the top showcases amazing views from every side… something I particularly enjoyed as I the views can never be truly appreciated when driving! 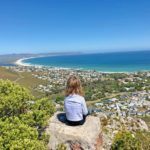 The way it works is that the tram has to be balanced on the top and the bottom so each time you hop on board you swop with the other group, taking turns to sit on the top and then on the bottom – thus giving everyone a chance to appreciate the views. 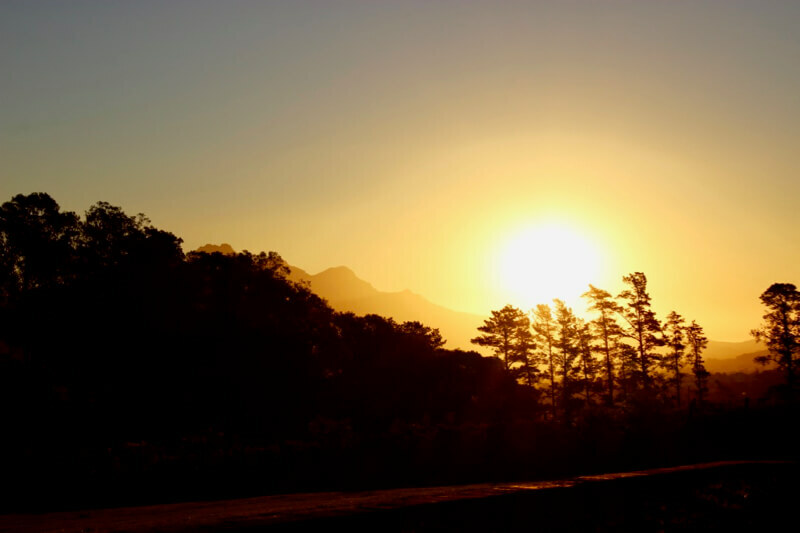 It is really hard to beat this scenery, anywhere in the world! Our first stop was Rickety Bridge. 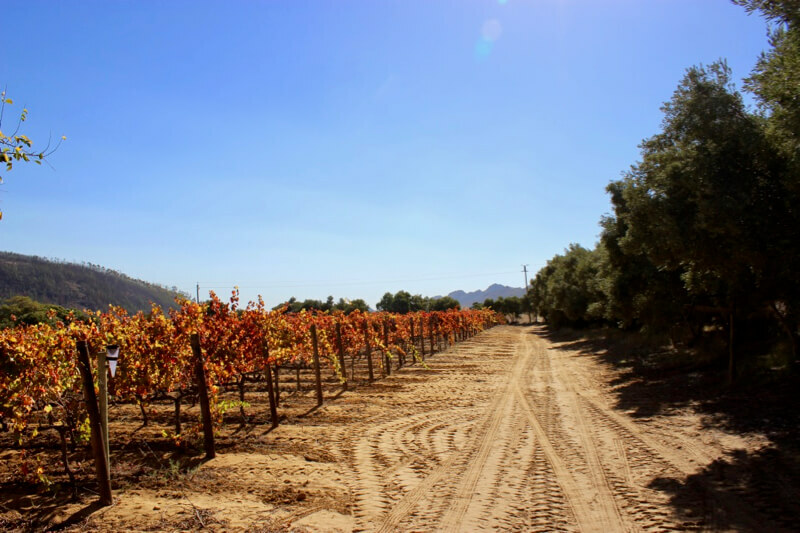 As we slowly drifted towards the tasting room our ears were a tuned to the sounds of a talented violinist playing for his group of friends. 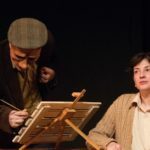 What an amazing experience to be surrounded by such stringed instrument entertainment! Only arrival we were hungry and ordered one of the cheese and charcuterie platters to go with their wines. 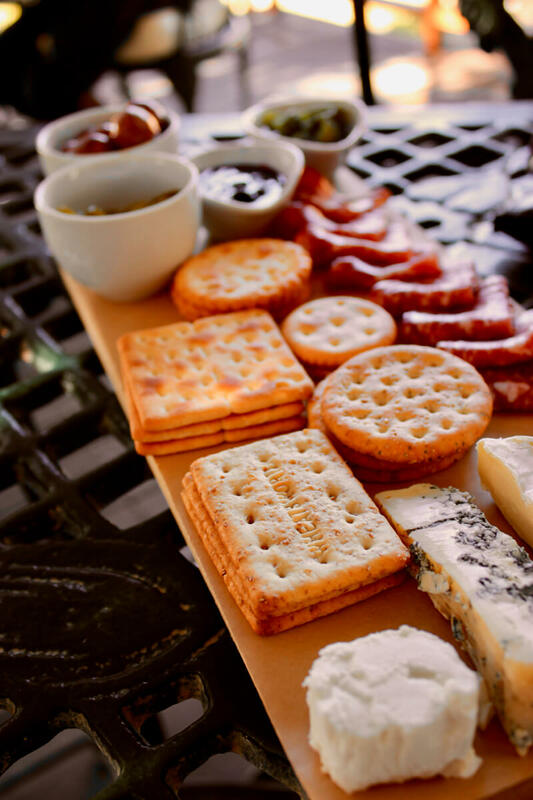 If I’m honest I could eat cheese and charcuterie all day long, any day of the week, all day, every day! It’s my favourite thing. well, second to wine! 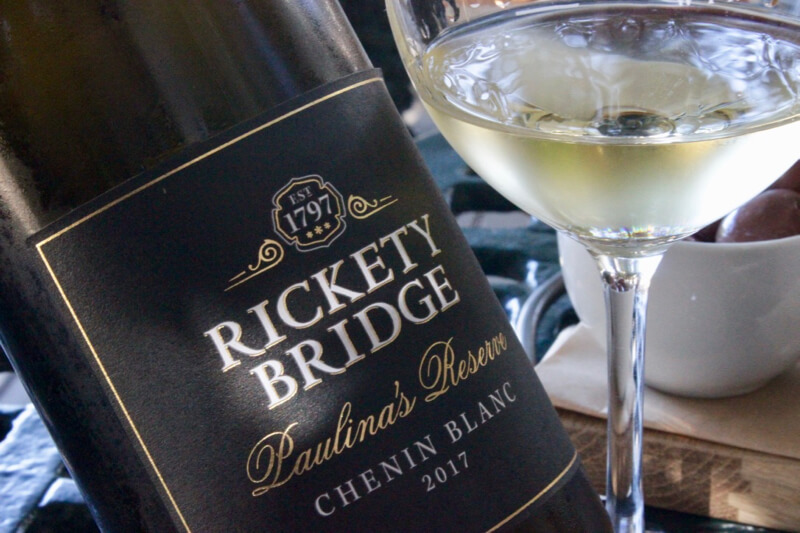 Rickety Bridge make some quality wine, with their Semillon and Chenin Blanc coming out tops. 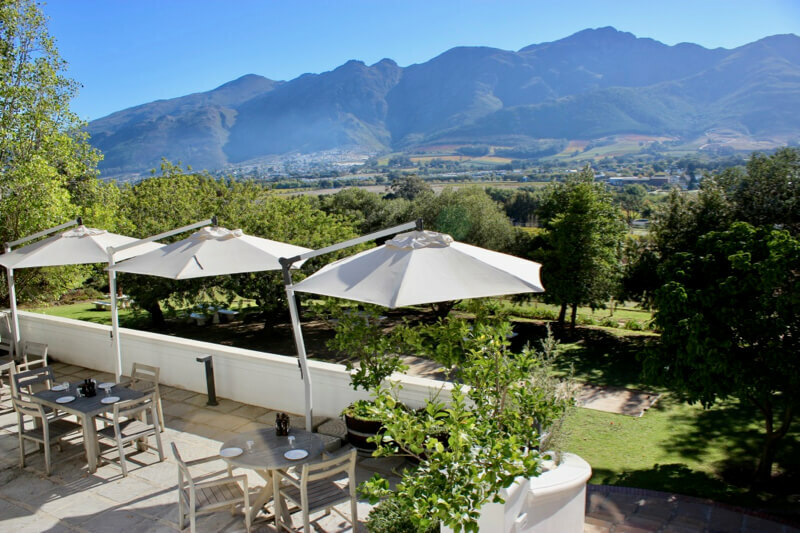 This was a perfect place to wind down and absorb the surrounding beauty that is Franschhoek. 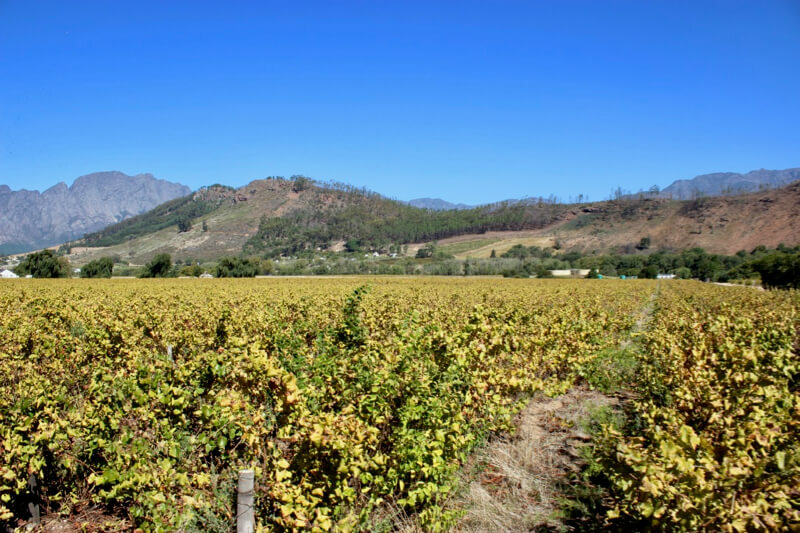 With palates sufficiently in tune with the fruits of the vine, Grand Provence greeted us. 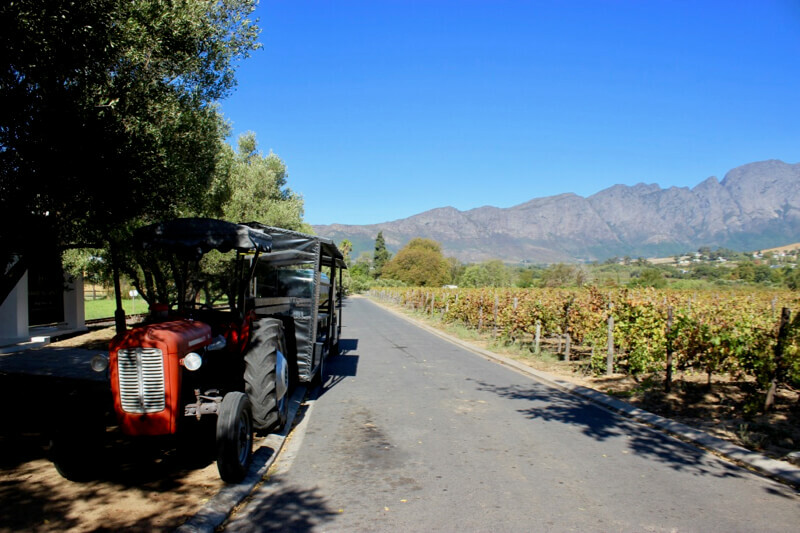 We hopped-off the tram and hopped-on to a very comfortable tractor ride through the vineyards to their tasting room. 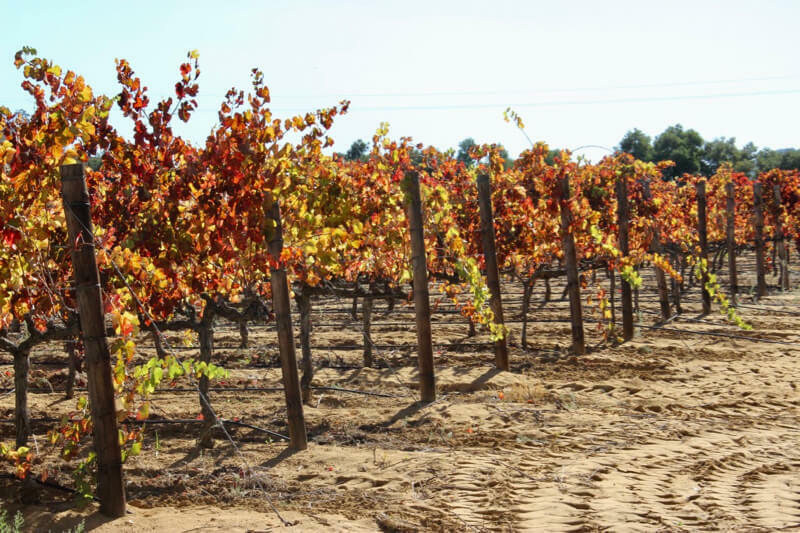 Another beautiful setting, highlighted by the colours of the autumn vines. 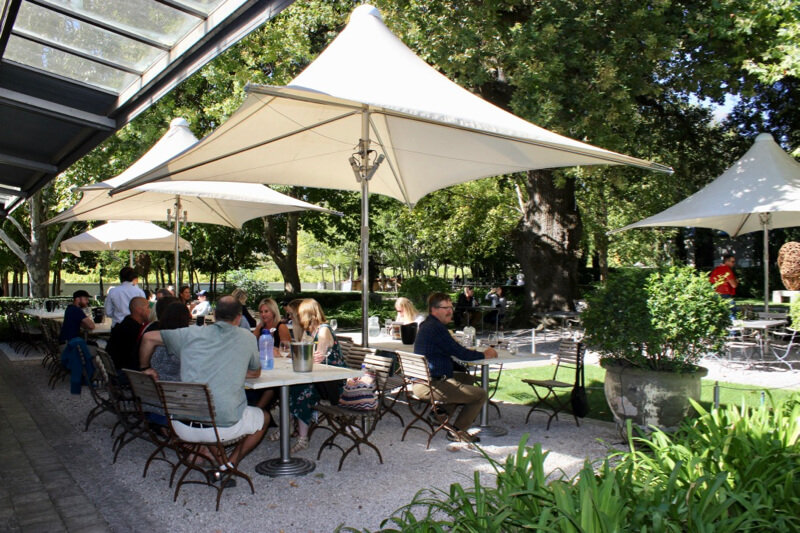 This winery is slightly on the more modern side, but equally welcoming, we sat outside, basking in the sun to enjoy a tasting selection of their red and white wines from their Heritage Range. We were a little on the rushed side of things on this stop as we were a little late and needed to catch the next tram line to get back onto our route of choice. (It can get complicated, esp after a few glasses of wine!) Unfortunately this meant that I unfortunately did not have the time to really immerse myself in their wine and form an opinion. I will have to go back! 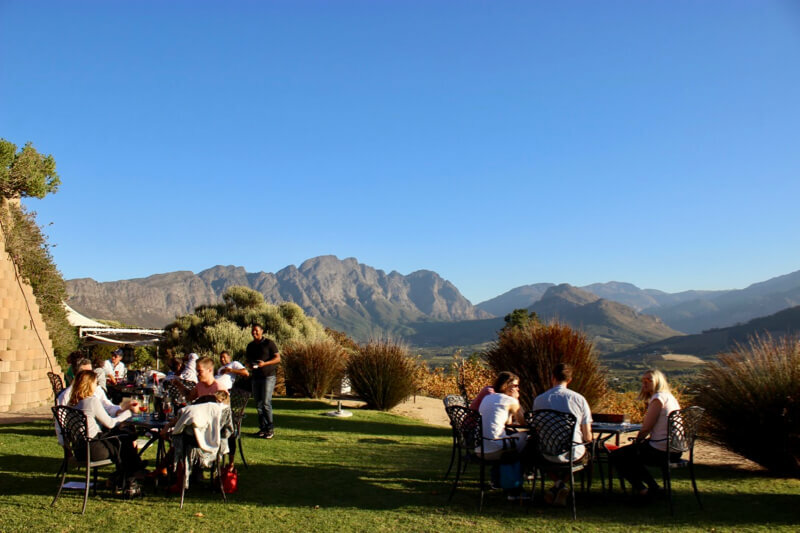 Our next stop was Dieu Donne Vineyards, where mountain views engulfed visitors indulging in wine on the grass. 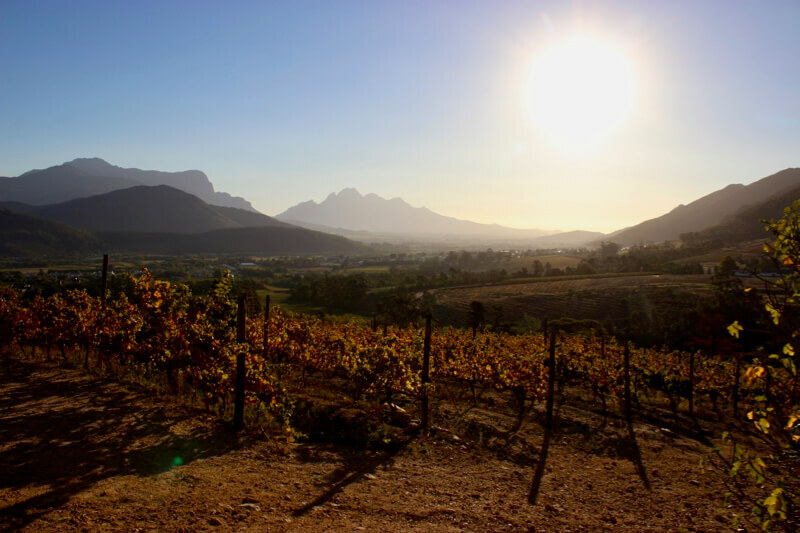 The sun was setting and we settled down outside for our tasting. 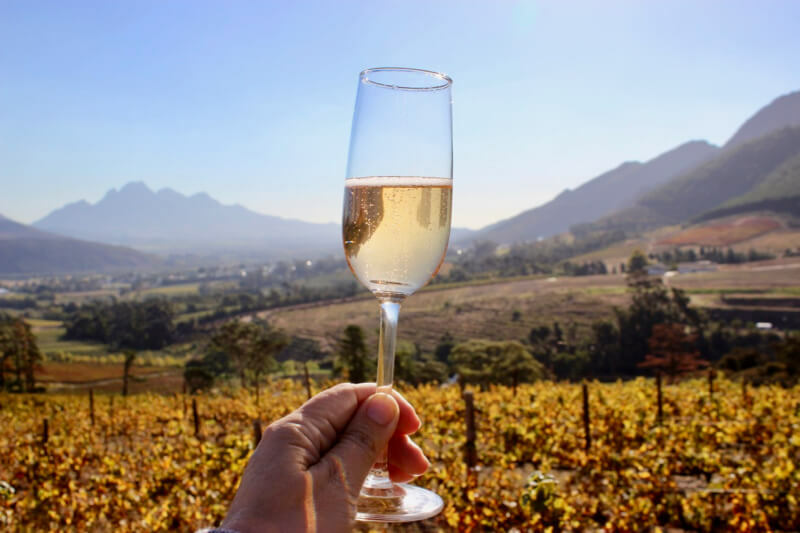 The weather was perfect, and the warmth of the setting sun was so welcome as we savoured our MCC welcome drink. As we were swirling Merlot in our mouths the familiar soft strings of the violin once again caressed our ears. 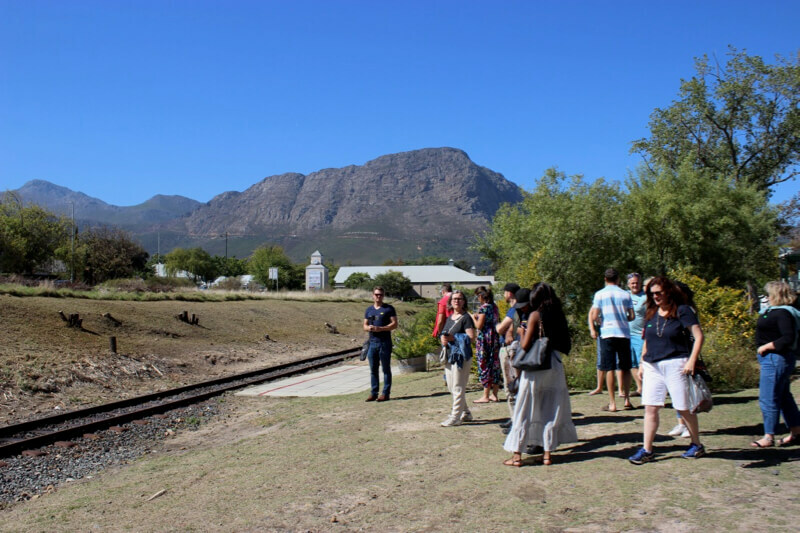 It turned out that the same violinist from Rickety Bridge, our first stop on the Franschhoek Wine Tram, had chosen this as their next stop and their party of 8 had arrived. How luck were we to get to enjoy the sounds of their talented violinist friend entertaining them with his folk style talent. 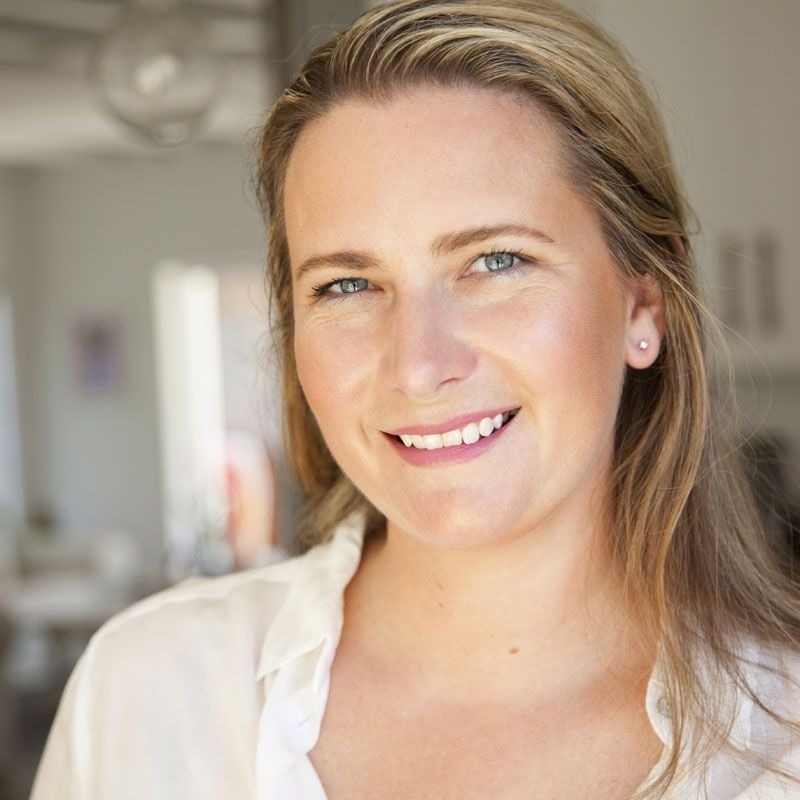 It was an unexpected and magical accompaniment to our Wine Tram experience. 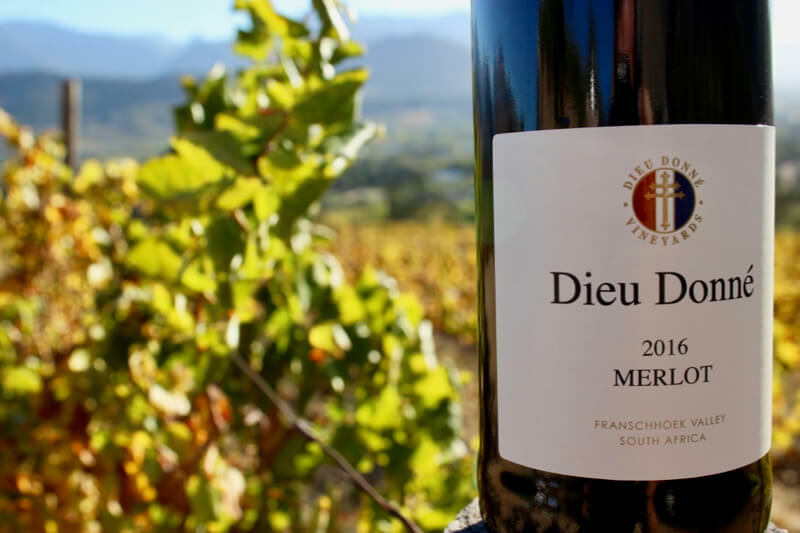 The Merlot and Cabernet Sauvignon at Dieu Donne were particularly impressionable. Kathryn, not a keen fan of red, found she really enjoyed their Merlot. 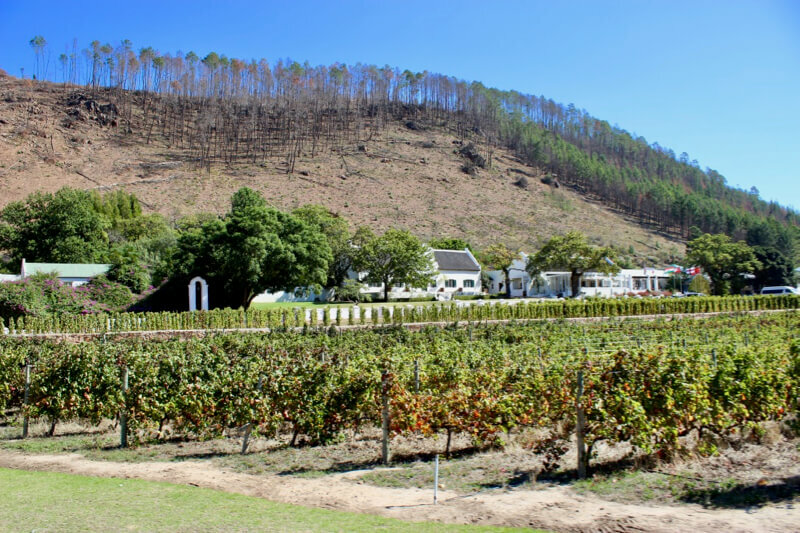 To conclude our Franschhoek Wine Tram journey we decided to do our own quick visit the following morning to Mont Rochelle, another wine farm on the wine tram route that we had never visited. What an oversight! Set up on the hill side, here we enjoyed panoramic views from the opposite side of the valley. At Mont Rochelle we had a very enthusiastic wine tasting specialist dispensing more knowledge than wine, with a clear passion for what he was doing. 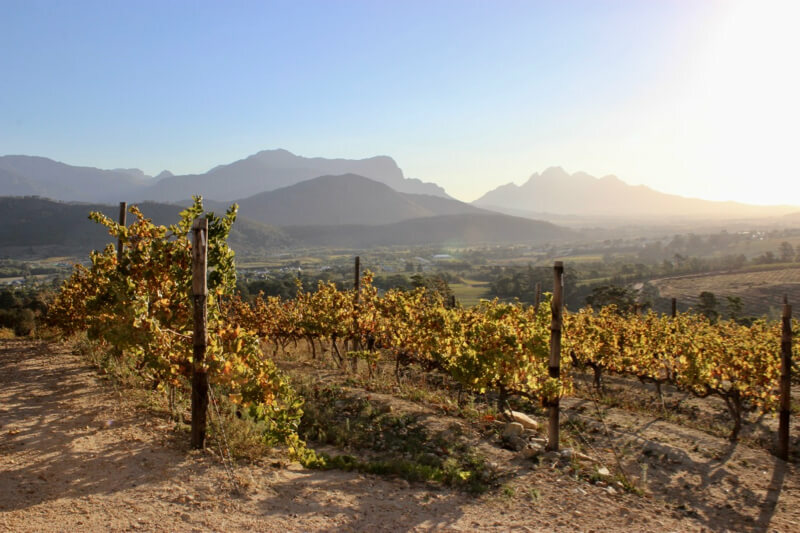 Their Merlot and Sauvignon Blanc were particularly enjoyable, and we spent a good long time lapping up both the wine and scenery. Although we did not eat at the restaurant, it had loads of character and will be on our list for sometime on the future! 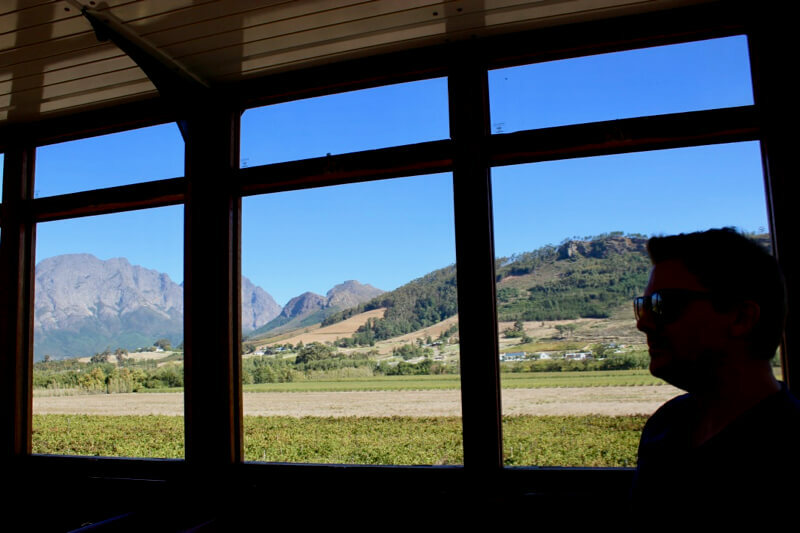 So, upon reflection, the Franschhoek Wine Tram was an extraordinary experience, which gave me permission to really relax, and indulge in the wine tastings without my conscience slapping me about the head reminding me that I have to drive afterwards. 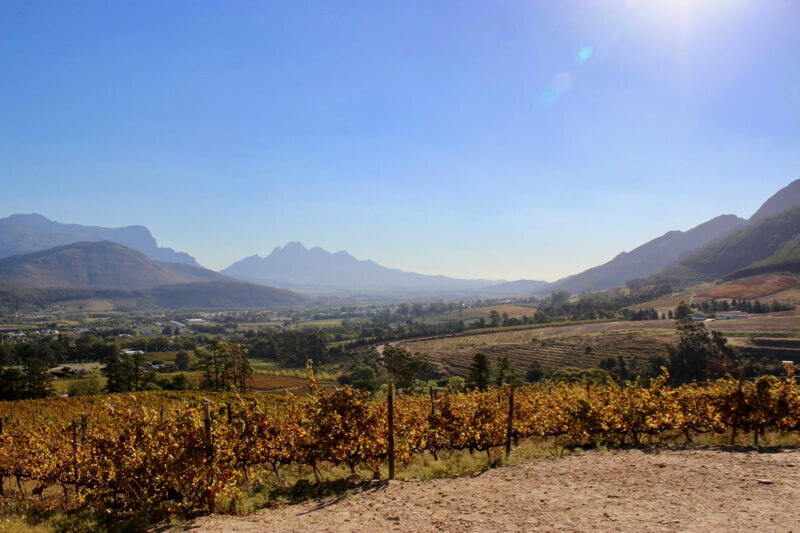 We could both enjoy chatting, taking in the scenery, moving from one wine farm experience to the next, enjoy a leisurely lunch, and, while a fair amount of wine is consumed, had the time to sober up to the point of being able to drive home (or to our guest house) responsibly! 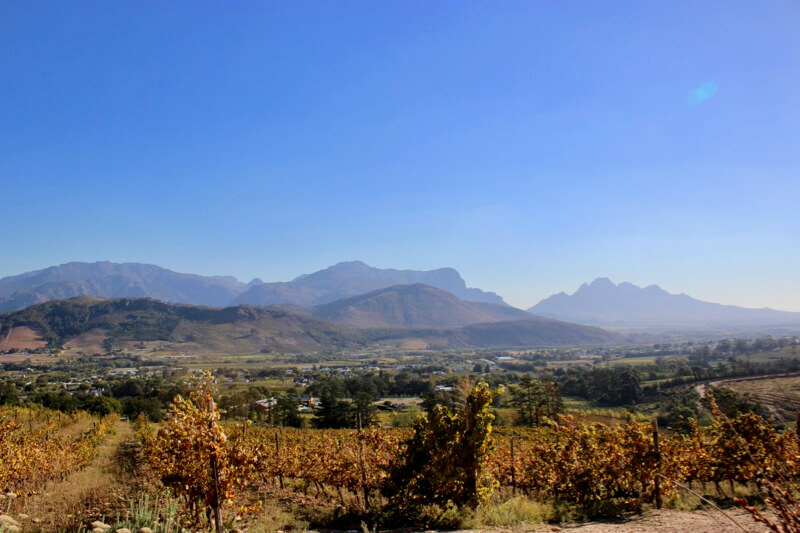 Highly recommended as a way to spend a relaxing day out in the Franschhoek Valley.